Note: Because of the Christmas Holiday Season, and because this is the final scene in the second story, we will take a one-week break. The next scene will be posted on Jan 3, 2019! See you then! Antonerri picked up a small reed from the cup by the candles. He gently held it in the flame of a candle. Soon, it caught fire with a small tongue of its own flame. He brought it across the altar to light more candles. They were short and wide, each one in its own glass bowl. There were dozens of them, some fresh and stout, others burned hollow. The altar was long, with a soft velvet-covered kneeling stool running along it, all the way across the front of the chapel. He lit twelve of them, then whisked out the flame, before it could burn his fingers. Five for the ones we rescued at the manor, three for the ones we brought back from the market, and four for the ones we couldn’t find. Several days of rest, herbal ointments, and care had done much to ease the pains he had endured. Still, he felt the soreness as he knelt before the altar and bowed his head. His mind reflected back on the changes these few short weeks had brought. His future was still uncertain. I can’t go back to the Holy Guard. In Twynne Rivers, I am a heretic, an outcast. But, for now, the brothers here in the wooded abbey sheltered him and his friends, alongside the orphanage. His mind flowed through thoughts of those he had fought next to. They were such strangers, but bonded together by circumstances. He felt the deep gratitude that comes with having good friends, a feeling he wasn’t accustomed to. Antonerri also nodded, and closed his eyes. Light footsteps interrupted them, and they both looked back to see DeFrantis standing in the chapel aisle. The dress she wore was not as fancy or lacy as Thissraelle’s style, but certainly finer than her rough and ragged street shirt and leggings. Her dark hair, though nicely brushed, still hung down into her eyes. They shone with a peace and calm that Antonerri had only come to see in the last few days. Standing behind her hip, behind her dress, was Lilia, a young girl of about 8 winters. Since they came back from the manor in the woods, she was never far from DeFrantis’ side. “The brothers in the kitchen have asked me to gather everyone for dinner...” She said, then waited for them. They stood and walked to her. She turned with them and they all stepped down the aisle together, with Lilia skipping ahead, her hair and dress swinging with each jump. The low afternoon sunlight shone through the tall stained glass windows, spreading heavenly vivid colors over the pews and onto the opposite wall. Antonerri grunted as he lifted DeFrantis up into the wagon. Then, he climbed up in to the bed and shifted her over. He covered her in blankets and she welcomed the warmth. As she settled, she reached up and took hold of Antonerri’s arm. “Thank you,” she breathed. He smiled, and moved to help the others as they approached the wagon. As he climbed out of the wagon, DeFrantis crawled to the back gate, looking out, but still too weak to get out. Karendle was approaching, limping, supported by Eddiwarth’s only partly steady step. Behind them, with an equally labored pace, came Granthurg and Thissraelle. Granthurg’s shirt was in bloody, tattered ruin, but his chest, arms, and torso were healed. Still, he was walking slowly and with stiffness. “Where ar--” DeFrantis tried to shout, before lapsing into a fit of rasping and coughing. “Relax,” Karendle said, “I have them. I kept them safe.” She arrived at the wagon and leaned on it for support. “Where are they?” Antonerri pressed, as DeFrantis gestured anxiously. DeFrantis relaxed and nodded. She reached out and took the stone in her hand. She whispered the children’s names as she cradled it close to her and settled back into the wagon. We’ll let them out when we’re out of the forest. Out of danger. “Wait!” Karendle interjected, startling DeFrantis. She held up the other gray stone. “Is this one the kids? Or is it the wizard?” She stepped forward and looked at them both very closely. Granthurg lifted Thissraelle up into the wagon bed, then moved toward the horses. Antonerri looked quizzically at Eddiwarth. 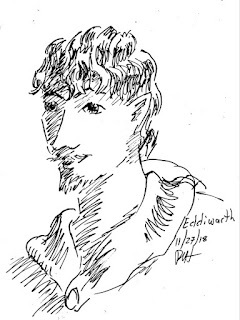 “Who are you?” Eddiwarth’s fine shirt was covered in dirt and soot, and he held up a grimy hand in greeting. He took a breath to speak. Karendle interrupted, “He’s with me.” Antonerri glanced back at her. “Really, he’s a good guy.” Antonerri looked at DeFrantis, pointing both at Eddiwarth and Karendle. DeFrantis smiled and nodded. Yeah, they’re with me. They’re with us. The old wagon creaked hard with the added weight of the extra riders, but it lurched ahead, tossing back and forth as it rolled away from the manor and into the forest. He shifted his sword and rushed toward the mage, who held her in a death grip in the air. Anger flowed through his arms. Rage drove his feet. When he got only a few steps away, the wizard casually pointed and a blast of energy arced across the space between them. It hit Antonerri in the chest and shocked him, jolting him back from his trajectory. He rolled away, his legs twitching with the pain of the surge. His gaze narrowed as his stare dug into DeFrantis’ eyes. “They’re nothing. NOTHING! Just to be meals for Dragons!” DeFrantis’ eyes suddenly widened as the horror of the understanding struck her. Don’t touch her. Antonerri struggled against the pain in his limbs. He knelt, then stood. I will save her. We will save them. You will not hurt them any more. Antonerri stepped forward, and brought his sword up before him. “You’re determined, I can see,” The mage said with tight lips. “Let me introduce you to PAIN!” More lightning surged from his outstretched palm, striking Antonerri. The energy shot through his limbs, driving him to his knees. Again and again, the mage blasted, tearing screams of anguish from Antonerri’s throat. Finally, he stopped, and Antonerri collapsed. His body felt the pain, the familiar pain. I took the blasts for you once before, and I lived. A new sensation rippled through his shoulders and down his spine, along with the pain. I lived, and later, I chose to live. He lifted himself up, and picked up his sword again, as the warm feeling grew in him. I choose to live, now. I will defend the weak. I will fight for the poor. I will fight for you! Antonerri stood and straightened his back. The mage’s blast struck again. Antonerri felt the jolt, felt the pain, but didn’t scream. The warm glow strengthened with the blast. I will fight for the children. Antonerri felt it coursing through his body. Pain wracked his limbs, but he stood. The light around him supported him, strengthened him, enlightened him. Antonerri coughed, then spoke. “Pain and I are old friends.” He raised his sword. A familiar power welled up inside him, a light he had not felt in a long time. He focused this will into the blade. It burst into a bright radiance, with rays of light flowing off of it into the smoky air. He stepped forward, moving through the ache. The wizard took a step back, and fear rushed over him. He held his hands out before him, but no powers came. “... EVER AGAIN!” Antonerri lunged forward in two deep strides and thrust his sword before him. He drove the bright flaming blade deep into the mage’s chest. The wizard gasped for breath, flailing his arms, grasping at Antonerri’s shoulders. The sword’s light burned through him. The wizard’s eyes rolled up, his head dropped back, his legs failed, and he fell to the floor. Antonerri turned around to see his companions staring at him. Granthurg sat up, and Karendle moved out from under him. Thissraelle stood, supporting Granthurg. DeFrantis nodded and buried her head into Antonerri’s shoulder. “Gather the children...” she mumbled with what breath she could muster. The explosion ripped through the smoky air of the room, shaking the floor and bouncing back and forth between the walls. The flash was harsh and blinding. Karendle was jolted off her feet, and fell. Something large and heavy fell on top of her, twisting her leg and pinning her to the floor. She called out in pain, and tried to squirm free, but it held her pinned. She shook her head and tried to see. Quickly, her vision cleared, and she saw Granthurg’s bloody shoulder over her hip. To her left was his warhammer, quietly resting on the ground. Just beyond that, the floor burned. Again, she tried to squirm away, to turn her body, but his weight was too much for her. She was finally able to shift so her hip hurt less. Thissraelle moved her hands over Granthurg, frantically trying to summon the the last of her will to heal him. Beyond Thissraelle, she saw DeFrantis heft her sword, and rush forward. Karendle lay back and looked up to see the other mage floating above the fires. He was swirling his arms over the flames, using his striking powers to stoke them higher. She felt the heat growing, and saw him start to move the blaze forward toward her and Grathurg. What can I do? Fear started her heart racing, making sweat bead up on her face. I can’t move! We’re going to die! She reached to her chest to steady her heartbeat, and felt the pouch. She had hung it around her neck, thinking that it would be more secure than at her waist. She opened it quickly and and dug inside. What can I do? She pulled out the stones. Two round and gray, one a sapphire gem. He’s a wizard, isn’t he? Am I not supposed to catch wizards? She smiled. Wait, which one is it? This one? She held it up, studying it in the firelight. Yeah. This one! She stretched out the stone toward the flying wizard, and focused deep. The intensity of the fear and the pain drove her will, and the silvery light came to the stone quickly. It shone brightly, even by the fire, and leapt forward to engulf the mage, pulling him down and out of the air. He struggled, shouting. No! She gritted her teeth, and squinted against flame’s heat. You’re not hurting my friends any more! The mage’s shape twisted, distorted, and swirled around the stone, until the light dissolved into it. Karendle dropped her exhausted arm. Granthurg stepped through the portal, ducking low as it grew. The room was large and well lit by flames dancing on the floor and running up the formerly elaborate tapestries on the wall. Right away, he saw his friends in trouble. To the right was Karendle trying desperately to fend off blows from a man grappling on top of her. To his left was DeFrantis, obviously exhausted. Antonerri had come through the portal first, and immediately engaged the man attacking DeFrantis. Their swords shimmered with reflected firelight. The heat from the fires was uncomfortable, as was the smoke they were creating. Granthurg turned the other direction, strode toward Karendle and, with a grunt, kicked the attacker off of her. 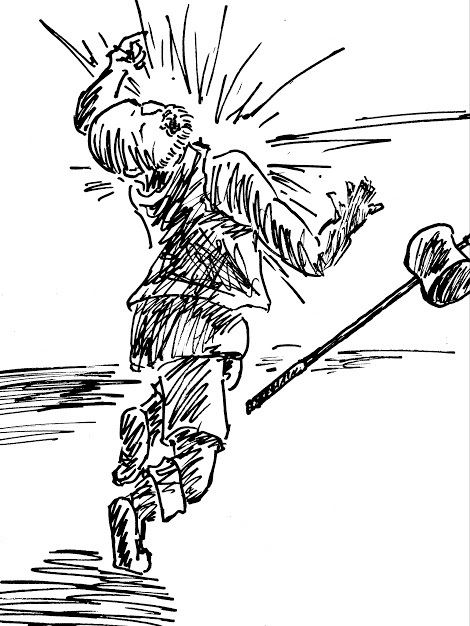 The impact of a booted giant’s foot rolled him away, coughing and gasping. He stumbled to get up, just as Granthurg's upward swinging warhammer caught him straight in the gut. The impact lifted him and dropped him to the floor, unmoving. 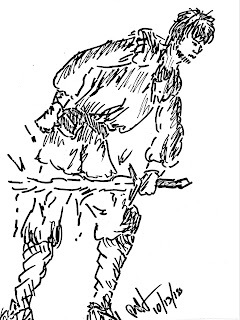 A taller, more muscular man rushed at him, thrusting with a sword. 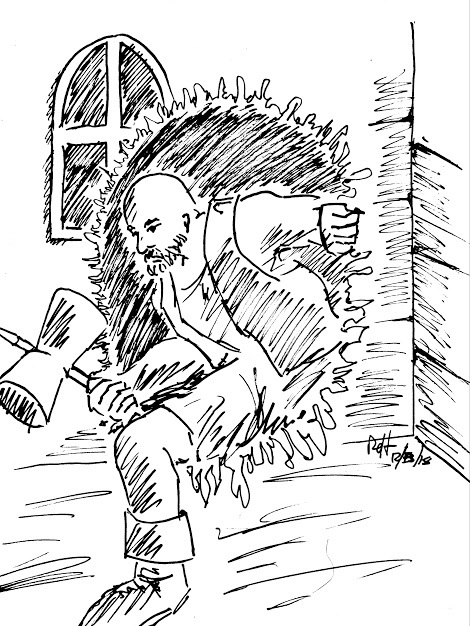 Granthurg stepped aside and turned the handle of his hammer to parry the blade. He was large, but not as massive as Granthurg, who braced himself low and used his leverage and hammer's mass to push the assailant back. He saw a motion behind him, and glanced over his left shoulder to see. It was Karendle rushing over to support Antonerri. The man before him used that second’s hesitation to take another swing. Granthurg had to twist and step back to avoid it. Granthurg caught the man's eye. He saw rage and aggression under his furrowed brow. Is there a bit of fear there, too? He used his giant legs to retreat back in a large stride. The man lunged ahead, shouting, eager to take advantage. His confidence turned to surprise as Granthurg leaned back into his assault and swung his hammer in a low arc, sweeping the man's forward leg. Cracking, it fell out from under him, and he collapsed in pain on the floor. Granthurg brought the Hammer around, up, and finally crashing down onto his chest. Standing straight, he looked left to see the others. 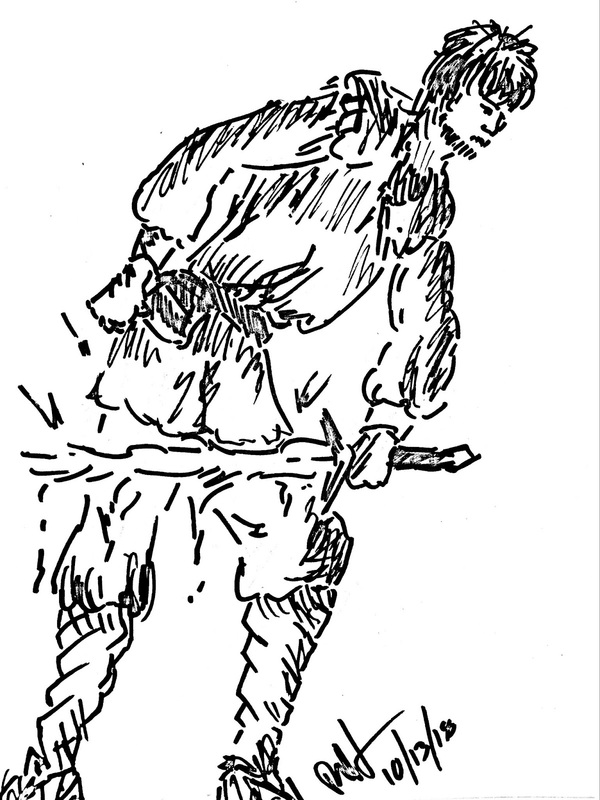 Antonerri had driven his opponent back to the fire on the floor, and Karendle was locking swords with another fighter. A thinner man, an elf, was behind him, and Granthurg saw something small and silver flash in his hand as he rushed forward, sticking into her attacker’s back. He stepped away and the man dropped his sword and collapsed. “This ends NOW!” Granthurg heard a voice shout from across the other side of the room. He saw two men as they entered the room from a hallway. They wore dark robes and cloaks. One of them drifted up over the flaming floor. The other crossed opposite him and stood ready, in a commanding stance. Granthurg recognized the dragon and flame icon stitched into the front of their tunics. 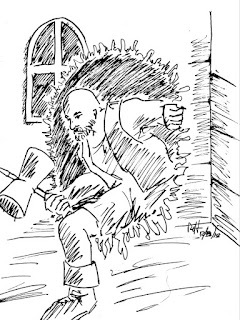 He smiled as he hefted his hammer and stepped toward the leader. The other, from the air, extended his hand toward him. “Not so fast!” he shouted before pushing out a pulse of orange red power. It hit Granthurg square in the chest and exploded in a overwhelming flash of bright, noise, and pain. Mom? Is that you, mom? He looked at his hands and arms, now bloodied. Something was moving beneath him on his left side. He looked and saw a girl struggling to get out from under his back. Who are you? What’s happening? As his awareness rushed back to him, and his head suddenly cleared, the pain in his arms and chest overwhelmed him as well. It hurt to breathe. It hurt to move. It hurt to be. He lifted his head and saw DeFrantis rush toward the mages with her sword drawn. The mage lifted his hand, dripping with blue light, and DeFrantis surged up into the air, kicking and choking. I have to help her! Granthurg tried to move, to get up, to reach his hammer. His head spun before he fell back into blackness. They moved quickly down the darkened hallway. DeFrantis, determined, and surprisingly forceful, was in front. Behind her was Eddiwarth. Karendle was last, herding the five children in front of her. Karendle glanced down at the sword in her hand. She hefted it, feeling its balance. She had picked it up from the men they had just fought. DeFrantis had gotten the other one, and handed off the rondel dagger to Eddiwarth. There’s gonna be a fight. We don’t have much to fight with, but we’ll have to make do. She was struggling to keep the kids moving. They’re scared, I get it. But we can’t sit down and cry, here! Her mind focused on the hallway and Eddiwarth’s back to keep her own fear and tears down. I just wanted to learn to be a mage. That’s not too crazy to ask, is it? Just learn a few tricks? Now here I am chasing kids and running for my life! They rushed through an opening into a large hall. DeFrantis and Eddiwarth took in the space quickly, but Karendle couldn’t see as well from the hallway’s end. She could see some candelabras and tapestries on the far wall, and it looks like the ceiling was quite high. Maybe in its day, it was a grand ballroom. “There’s the door!” DeFrantis called out. Just as she started to move toward it, Karendle heard heavy footsteps and shouting burst into the room. She nervously shifted the sword from one hand to the other. She could see past Eddiwarth’s shoulders into the room, where four or five armed men stood. It was dark, and she couldn’t get a good look, but the threat was as heavy in the air as the mage’s bane smoke had been. The hushed moment when the two groups surprised each other was really only a matter of a second or two, but it seemed to suspend time. It broke when DeFrantis said, “Karendle, save the kids!”, and the men rushed forward, swords drawn. She saw Eddiwarth crouch down low and sweep his hand in front of him. Halfway across the room, flames leapt up from the floor making a high infernal wall. Half of the men were surprised, and backed away from its heat, but others quickly started to turn around it. DeFrantis lunged forward. Karendle backed the kids into the hallway and stepped between them and the opening to the room. What to do? I can’t just stand here and let the others get killed, but I have to guard the kids, too! Eddiwarth shifted forward and Karendle moved to the hallway opening to see what was happening. DeFrantis had engaged with one of the men. She was struggling to block his sword blows. Another stepped toward her, and Eddiwarth thrust his hand forward. The man was suddenly in the air, swinging his feet, and flew backward into the wall. DeFrantis slipped and lost her footing on a rug, stumbling backward, then regained her balance. She isn’t doing well! She’s probably saving her powers. Karendle reached out and took the dull grey stone from the girl. Maybe... That might work! She looked up at the kids, who were all huddled together in fear. She smiled at them and said, “I have an idea, but I don’t want you to be afraid. I’m not going to hurt you. Can you all be brave for me?” The oldest girl looked at the others, and then back up at Karendle as they all nodded. Their hopeful, dirty, and tear-streaked faces hit Karendle deep, like a punch to the gut.